I landed in Gujarat the day Swachh Bharat Abhiyan was launched by our Prime Minister. It was 2nd October 2014 and Gandhidham in Kutch District railway station was spotless with many volunteers cleaning the platform and the area around the railway station with brooms. I was not able to listen to the PM’s first edition of ‘Mann Ki Baat’ but the message was loud and clear – the way Gandhiji made every Indian believe that they were part of the freedom movement just by wearing khadi, our PM made every Indian an agent to country’s cleanliness and eventual development. If one could clean their surroundings and sustain it, they were part of a nationwide movement! A great idea but was it really going to change us? The initial messages were a plea to keep clean. But this advertisement made an attempt to change the approach towards the campaign. It was no longer cool to be dirty and the thought resonated – thodi sharam karlo, soch swacch karlo! I could see people act repulsed when someone littered. I’ve seen a few even clap at those who spat on the road. Gandhigiri had just become the common man’s cause, and towards development. Cricket is not just a sport but a religion in India. It is a game played with unbridled enthusiasm in the gullies across Mumbai. Unfortunately, a lot of these streets are littered with garbage, denying children the space to play. ‘Clean Sweep‘ aims to create awareness on the shrinking space for kids to play thanks to garbage that is dumped in those areas. 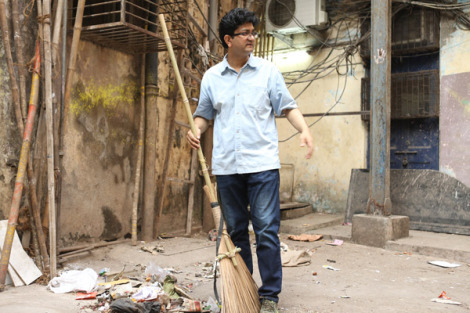 Being an active member of the Swachh Bharat Initiative, Prasoon Joshi, picked a location and armed himself with a broom. He had taken it upon himself to clean up a locality in Lalbaug where garbage was preventing children from playing cricket. The activity was finished with a game of underarm gully cricket in that very location for the youngsters of the colony. The ministry of information and broadcasting on 2nd October released the audio track “Swachh Bharat Ka Irada Kar Liya Hum Ne” composed by Prasoon Joshi and sung by Kailash Kher. The song, specially prepared for the Swachh Bharat Mission, was composed in a very short span of time. He also nominated 10 people, including Venu Srinivasan, Kiran Rao, Neerja Birla, Nitish Kapoor, Sadhguru Jaggi Vasudev, Irrfan Khan, Jeev Milkha Singh, Shankar Mahadevan, Amaan Ali Bangash and Ayaan Ali Bangash, to carry forward the message and aim of his ‘Clean Sweep’ campaign. 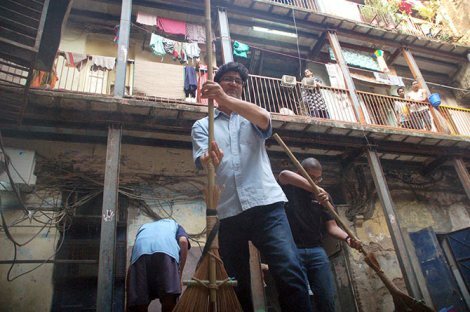 IndiBlogger had partnered with Clean Sweep in Mumbai during its launch by Prasoon Joshi. I had the privilege to be part of it along with Heena and Keyur from Mumbai. Indian Bloggers come together across the globe.